I’ve been working as a psychotherapist and coach-mentor with individuals and couples for the last 30 years. Below are some highlights from my path. Every work related skill I use and am certified in, was an ally to my own body, mind and soul before I applied the modality to my work professionally. Hakomi Therapy, and Trauma Work. My (as is yours) exquisitely intelligent body has always been guiding my life. There is a whole-body wizard within me who knows each moment what I need, how much, and when. Since 1978 when I first met Ron Kurtz the founder of mindfulness based Hakomi Therapy, I tasted the manna of this life giving path. I am certified in this work that creates living conversations between our conscious self and enlivened whole body-being wisdom. Alive to embodied presence, we always step more solidly into each next moment. The Hakomi approach elegantly works with our traumatized tender being where our suffering is emblazoned within our Nervous Systems. Unity, Non-violence, Organicity, Hakomi principles, serve the release and healing of trauma -- the overwhelm locked in our embodied beings. Vibrancy appears naturally when the traumatic is freed to move and complete itself. I gasped in wonder the first class that I saw Hiroshi Ikeda Sensei move his partners on the Aikido mat. That love affair with the beauty, power, and wisdom of Aikido has lasted since 1981. My rank is now 6th dan and I continue to train. I have taught Aikido as a Contemplative Martial Art at Naropa University since 1991. 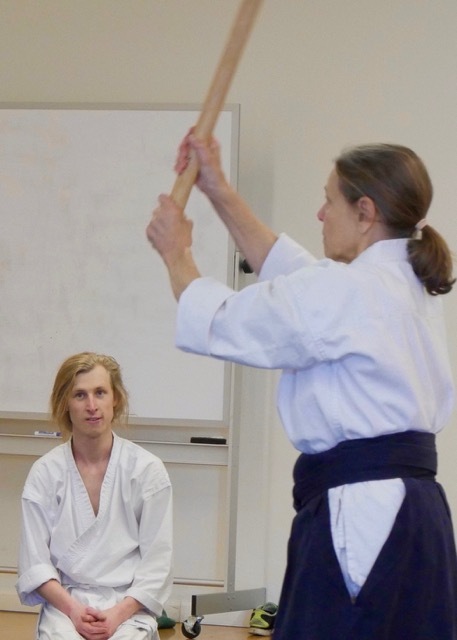 Applied to therapy/coaching, Aikido offers new perspectives, composure, and embodied skills to deal with life’s intense events. In 1994 I became a certified Shadow Work® individual and group facilitator. Shadow Work’s uniquely safe metaphorical approach supports our courage to reclaim our darkest knowledge and greatest fears. I have been so moved by the huge heart of compassion Shadow Work® grows in us. In 2001 4 Shadow Work colleagues and I co-created Women In Power Initiation, a program to safely support and guide women into transforming their most damning damaging shadow selves. I first met Bert Hellinger and Hunter Beaumont at a workshop/training 1997, the year they brought SCW to the U.S. When the “Knowing Field” of a system is represented and skillfully facilitated, hidden entanglements within the family or organization are revealed. What follows is a method of resolution for these often-invisible ropes of suffering that are knotted naturally into our bonds with our ancestors, those who have given us life. SCW knowledge and method dovetail beautifully with all my individual and group work. SCW greatly broadens, and deepens understanding of our vast capacity as humans for connections and loyalties, and limitations of loyalty. As I sit in therapeutic council with both male and female clients, often we grow painfully aware of potent times in clients’ lives that have gone unacknowledged and uncelebrated. When this happens, an emptiness of being and self trust occurs. They do not fully claim their maturity, nor shifts in social status. They remain young is disabling, often irresponsibly immature ways. A part of them seems stuck in the past. Our work together can identify and honor these significant portals. Usually on the spot we can co-create satisfying ceremonial forms to honor and empower the true identity. Appropriate actions follow that align with the reclaimed status. I’ve purposefully cultivated ceremonial arts in my own life since I participated in moon lodges for many years; I moved into the Rolling Crones. I am a participant and leader in the former Earthsong Ceremonial Dance Community. I’ve tracked and studied my own and others dreams for three decades. I work with ceremony as living art forms, that connect us to archetypal forces, metaphor, poetry, music, dance, drawing--to open us to the ever-creative improvisational nature of Life. For 8 years I led Reclaim our Feminine Initiations, to explore the crucial changes that occur with the blood mysteries of womanhood. In 2001, four Shadow Work® colleagues and I co-crafted Women In Power, an initiatory experience for women to explore their darkest demons. Our program continues to flourishes in the US and UK. My Master's Work is in the area of Individual and Organizational Systems, at Antioch University, MacGregor graduate school. My primary focus of study cultivated and evolved my unique approach that brings forth unused intelligences of my clientele to consciously weave their own embodied intelligence and disowned, vital selves into their everyday precious lives.